A BUTLER sports club has welcomed installation of a defibrillator near its home ground. 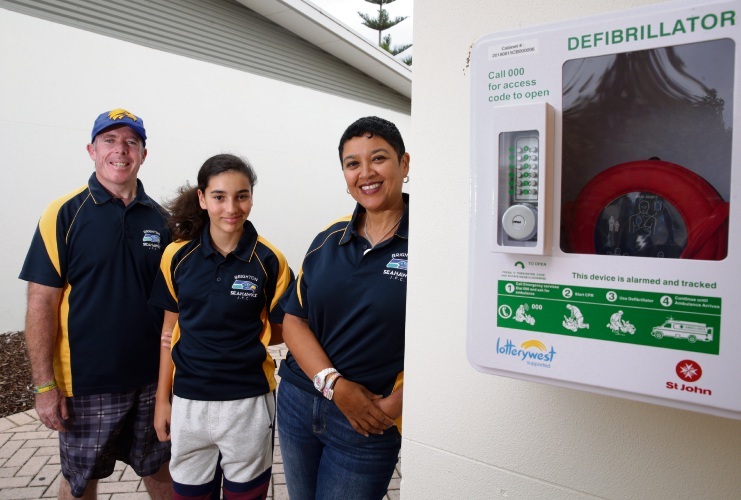 Brighton Seahawks Junior Football Club vice president Brendon Sharp said the club successfully applied for a defibrillator grant from St John Ambulance. The machine, used to restore the heart’s normal rhythm when someone goes into cardiac arrest, was recently installed at Butler Community Centre. Mr Sharp said it could be used in an emergency situation by all sporting clubs using the facilities, as well as members of the public. “As a growing club, we feel this is a vital piece of equipment and we are proud that we have secured this for our community,” he said. “The reason we applied for the grant was I had watched an episode of Ambulance Australia where there had been an incident at a football match where a defibrillator was needed, but they did not have one. Mr Sharp spoke to club president Stephen Kinnersly and first aid coordinator Kim Tully decided it was an essential piece of equipment for the club and community and applied for one through the St John Heart Grant program. “As a junior club with over 400 players that have grandparents, parents and other relatives of all ages and health conditions, we wanted to be proactive rather than reactive to ensure the safety of everyone,” Mr Sharp said. A defibrillator is a life-saving device used to treat sudden cardiac arrest, a condition that occurs when the heart unexpectedly stops pumping due to an underlying medical condition. Visit stjohnwa.com.au for more information on the St John Heart Grant program, which is funded by Lotterywest.